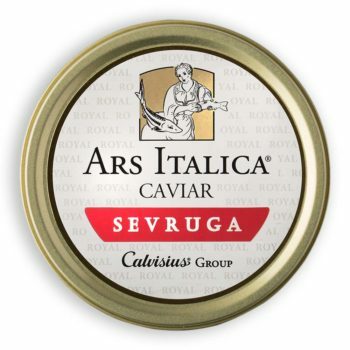 Sevruga caviar comes from the Starry Sturgeon, a small sized species which rarely reaches 55 lbs (25 Kg). It can be found in the Black Sea, the Caspian Sea, the Azov Sea and in the respective tributaries, and it is also in the Aegean Sea and eastern Ionian Sea. It has an aromatic taste and is characterized by small eggs (about 2,2 – 2,6 mm) with a color that varies from light to grey. It is an extremely delicate fish to breed and it takes from 8 to 12 years of waiting to get the caviar. 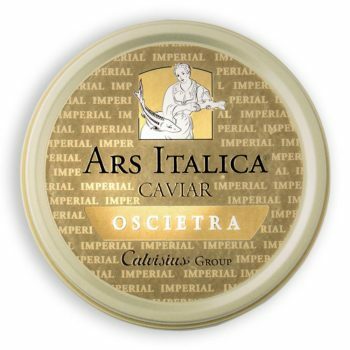 Oscietra caviar comes from the Russian Sturgeon (an ancient species originally native to the Black Sea, the Caspian Sea and the Azov Sea). It is a medium size fish that can weight from 44 to 110 lbs (50 Kg), providing a poppy and slightly nutty caviar with colouring that ranges from dark brown to beige. Many consider this to be the most refined caviar. Its eggs are large sized (between 2.7 and 3.2 mm). On average it takes 9 and 13 years before getting this precious type of caviar. Da Vinci caviar comes from the Adriatic Sturgeon, an Italian species which is typical in the Adriatic Sea and the primary waterways of the Padano-Veneta region, Dalmazia, Albania and western Greece. This caviar, with its fresh, intense and decisive taste, has a particularly smooth consistency and its eggs are characterized by medium sizes (about 2.4 – 2,8 millimeters) more often with colouring in shades of brown and black. It takes 10 to 14 years to get the best caviar of this species.